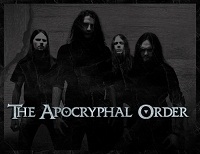 "Inspired by religious ignorance, prejudice and abhorrence, The Apocryphal Order from Tórshavn presents a discharge of Progressive Death/Thrash Metal fury with all their lyrics written in english. The band formed in early 2010 with the vision of bringing some bone crushing Death Metal to the already growing metal scene in the Faroes. From playing their first concert back in July 2010, TAO went on to record their first album in December that same year at Kohlekeller studio in Darmstadt, Germany." 1). Name 5 most important things in your life? It would probably be Music, Family, Mates, Toiletpaper and Beer! You just can't cope without those things. 2). Lets assume that in 2012 will be the end of the world.. what do you have to do till that time? Conquer the world with our METAL and Beer Drinking! Hehe, that oughta show 'em! 3). What fiction character would you like to be? Torkil: Superman – Very original, but who wouldn’t want to be indestructible and be able to fly. Ken: Batman - With his low voice, I bet he could pull off some monster growling vocals. Then Robin could do the cheesy clean backup vocals. Jóhan Bjartur: Ísak Petersen from Synarchy (laughing)! Or perhaps Tarzan. Can't think of anything better than running around naked all day, yelling at trees. 4). If Elvis was still alive, will he still be the king? Ken: James Hetfield will always be KING, no question! 5). Gather your dream band of the best musicians. Who would play guitars, bass, drums etc? Jóhan Bjartur: John Myung (Dream Theater) or Geddy Lee (Rush) slappin' it on the Bass. Ken : James Hetfield (Metallica) and Jeff Loomis (Nevermore) at the guitars. Martin: Dave Lombardo (Slayer) on the drums.